Morganton, NC, USA. 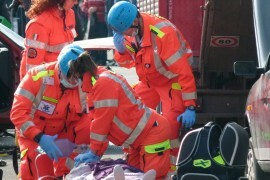 — On Earth Day 2012, the International Institute for Sustainability in Emergency Services (iiSES – pronounced “isis”) will formally begin operations in support of the Emergency Medical Services (EMS) community throughout the world. iiSES is a multinational non-governmental organization promoting sustainability in emergency services operations. The group defines sustainability in terms of environmental impact, economic management, and workforce longevity, among other parameters. iiSES currently brings together EMS personnel from Australia, Canada, the United States of America, the United Kingdom, the United Arab Emirates, Argentina, and the Philippines. Additional representation is expected shortly from the Republic of Ireland and Bhutan. The organization is actively seeking representation from other countries with emergency services systems. iiSES will begin by highlighting the few empirical studies addressing these issues, and will promote future research and publications. It will also provide a clearinghouse for various forms of literature and information on sustainability innovations in EMS and emergency services. Once a body of evidence-based and consensus opinion literature has been established, iiSES will begin developing best practices and position papers on sustainability issues. More information is available at the iiSES website, greenems.org, including contact information for those interested in joining this international initiative. This entry was posted in Recent News on April 9, 2012 by admin.